Though I haven’t gotten back into the kitchen for any creative cooking yet, I am able to mix up easy weeknight meals like this ravioli skillet. And sometimes, I have baby wrapped up against my chest for hands-free cooking! After all, gotta keep baby happy while I prepare to make my belly happy with cheesy, carb-ilicious goodness. With a big green salad on the side, this was one saucy, scrumptious one-pan meal! Just sizzle some Italian sausage in your skillet and add tomato sauce, diced tomatoes and Italian seasonings to make a quick and easy sauce. Toss your ravioli right in and let them bubble away ‘til they’re big and fat, then sprinkle on the shredded cheese. Under the broiler it goes to melt that gooey mozzarella, and onto your plate with a bit of fresh basil for garnish! 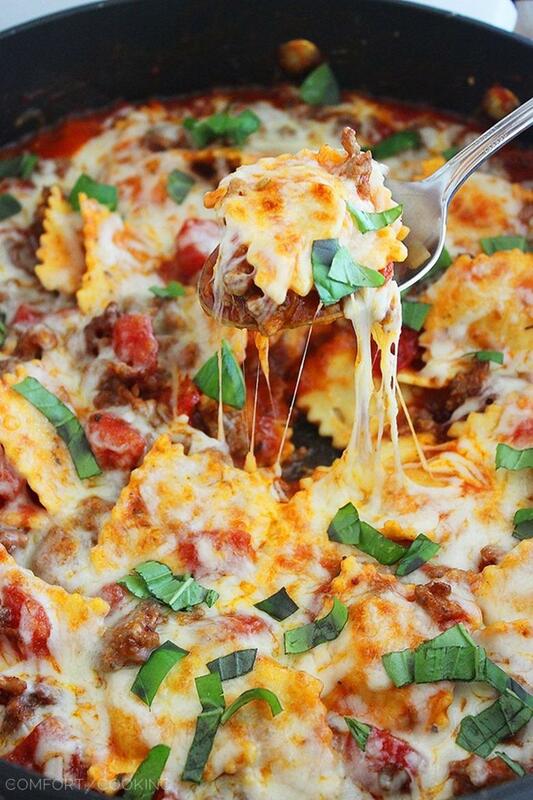 This mouthwatering ravioli skillet is definitely going to be part of our regular rotation. It’s super simple and full of hearty home cooked goodness – perfect for busy weeknights and delicious as leftovers! … If you’re lucky enough to have any. In a large skillet, heat olive oil over medium high heat. Add Italian sausage and cook until browned, 3-5 minutes, crumbling sausage as it cooks. Stir in tomatoes, tomato sauce, tomato paste, Italian seasoning, garlic powder, onion powder, and salt and pepper, to taste. Stir in ravioli and water. Bring to a boil; cover, reduce heat and simmer until ravioli is tender, about 10 minutes. Remove from heat. Sprinkle with mozzarella and Parmesan. Place under your broiler and cook until melted and golden brown, 2-4 minutes. Serve immediately and garnish with fresh basil, if desired. Needless to say this looks super duper yummy! I love having lots of amazing comfort-food recipes in my pocket for quick and easy weeknight dinners and this is definitely making the list! This skillet dish is insane! I bet the flavor is so amazing. Pinning! Adding this to our menu for this week! My family will love it! I made this recipe x3 before I had my 2nd baby and froze them for easy meals to throw in the oven, it is great! Happy 1 mth bday you your little one! 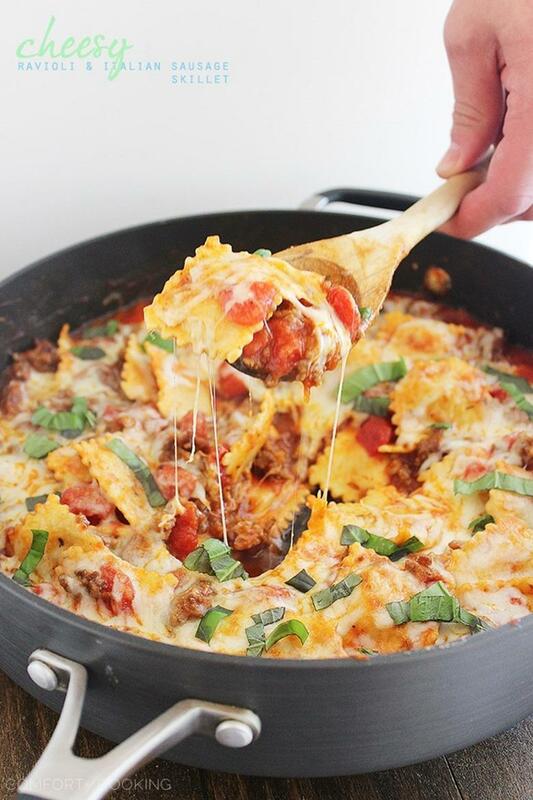 This cheesy skillet looks beyond amazing! And so easy! I love easy and cheesy never hurt either! Pinned! Girl, I hear you on doing everything one-handed these days! Which is why I’m pinning this recipe immediately and planning to make it soonest. :) Happy one month to your little lady! What a great skillet meal, love the ravioli! This looks incredible! Comfort food at its finest right here! Love this cheesy pictures, it’s making me hungry. Saw this on Instagram earlier and I was smitten! 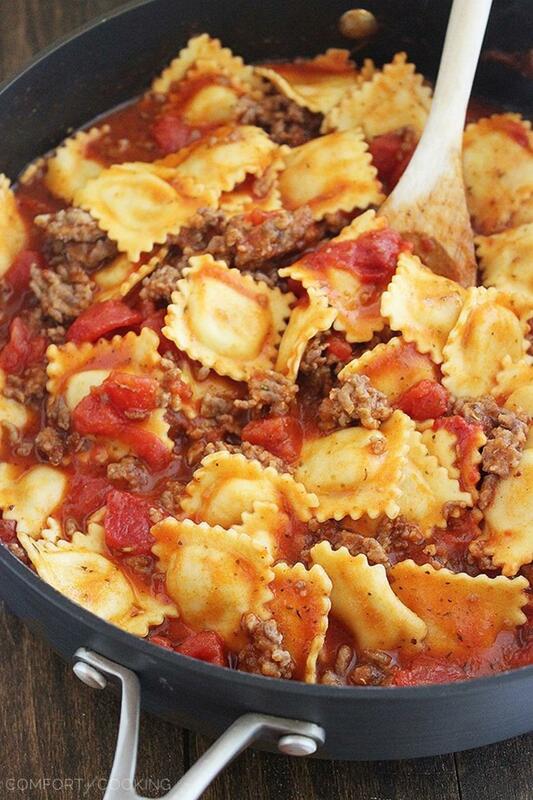 There’s nothing I love more than ravioli, but a one skillet wonder makes me love it even more! This is heaven on a plate – no doubt about it. I can’t think of anything more warm, nourishing or comforting on this cold day. 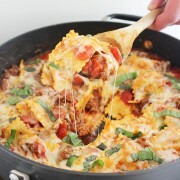 This skillet dish looks like the perfect quick and easy meal! a one pot meal that is a winner for sure. Who wouldn’t just love this! This is such a perfect dinner recipe! Love it! I love cooking meals in the skillet! Great pictures! One month?! Time does fly, doesn’t it? This is a great dish — we eat packaged ravioli from time to time, but just with a simple red sauce. I gotta try this — sooo tasty looking! Thanks. Pasta is always my go-to on crazy days. One skillet meals like this are true life-savers! Happy 1 month! Man, time just flies by. 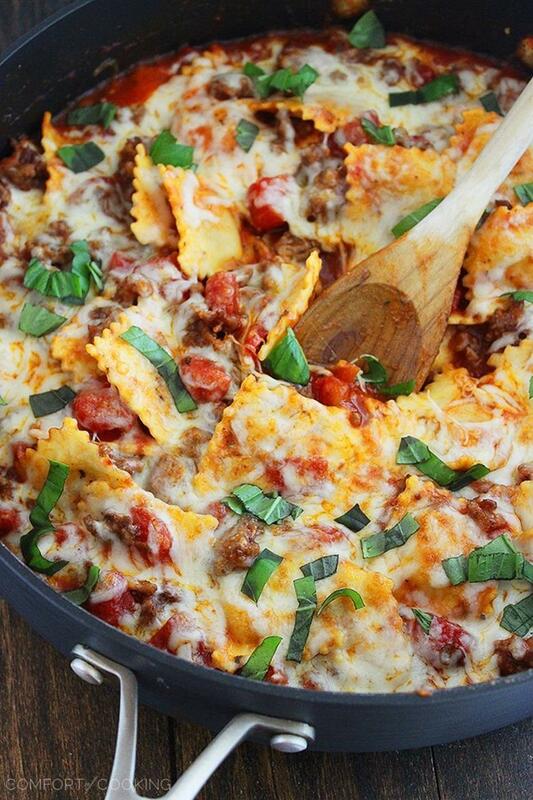 And this ravioli skillet looks absolutely amazing! TY. I can’t wait to try this! This was a fantastic dish! I was asked to make this at least five times before the meal was over! It was so delicous and simiple to make! Thanks for sharing the recipe! Another winner, Georgia! I made this the other night and it was delish!!! Definitely going in my “Keepers” recipe folder!! Thanks again for simple, tasty dishes! I used to love spending hours cooking from scratch but having two littles has made that tough! But your recipes have been motivation for me to get back in the kitchen and come out with a semi-from scratch, tasty and healthy meal to feed my family. Your website is my go to these days! Thanks again and looking forward to more wonderful creations! mayed this tonight did not change anything every one loved it thank you. This looks so so yummy ! I’m going to make it . This might be a silly question but if you have frozen ravioli do you leave them out a bit to dethaw before throwing them in the skillet ?!? Thanks so much ! Hi Sam – Not a silly question at all! There’s no need to pre-thaw your ravioli, just add them frozen to the pan. Thanks a lot for providing individuals with an exceptionally splendid possiblity to discover important secrets from here. It’s always so brilliant and stuffed with fun for me personally and my office colleagues to visit the blog no less than three times in a week to see the new things you have got. And of course, I’m so certainly amazed with your great secrets you give. Selected 3 facts in this post are undoubtedly the best we have all had.